Excuse me… there’s something in my watering hole! Last week our outfitters, Mel and Paige, took a few Airb&b clients to Galisteo Basin. This red painted desert ride wanders by a few old stock tanks left over from the original ranch lands. 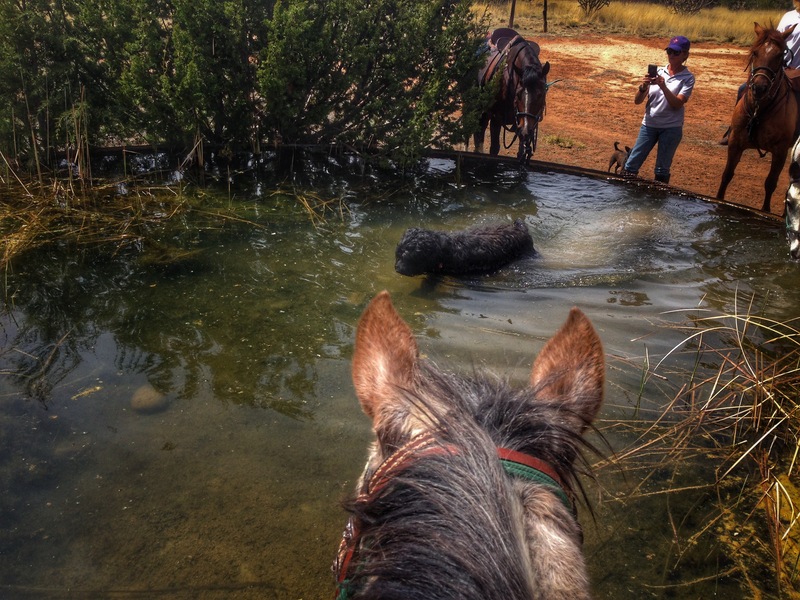 While the horses drink and splash, the dogs jump in to cool off. Chloe, the rather large black beast in the middle of it all, is a three year old Black Russian Terrierr we adopted two months ago. In January our 14 year old male BRT, Dodger, passed away leaving a huge hole in our hearts. Ten days later a female in Virginia came up for adoption. We flew out to meet the Russian beauty and instantly fell in love. 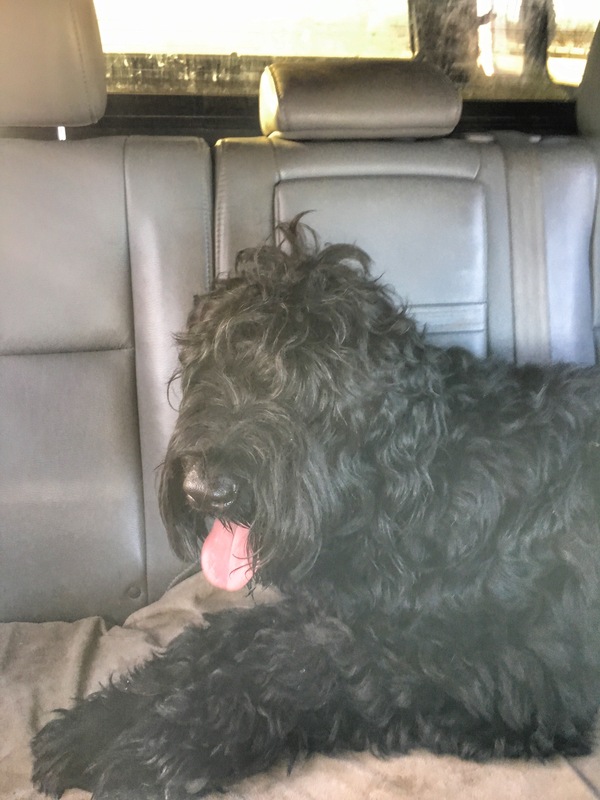 Our journey home turned into quite an adventure when the airline refused to transport her due to over weight issues. Instead we made an impromptu road trip for two and a half days back to New Mexico. It took a few months of conditioning for Chloe to slowly gain the strength and stamina needed to be a trail dog. She has been going on training rides from the ranch, but this spring day was her first time to trailer out and go for about three hours with clients. 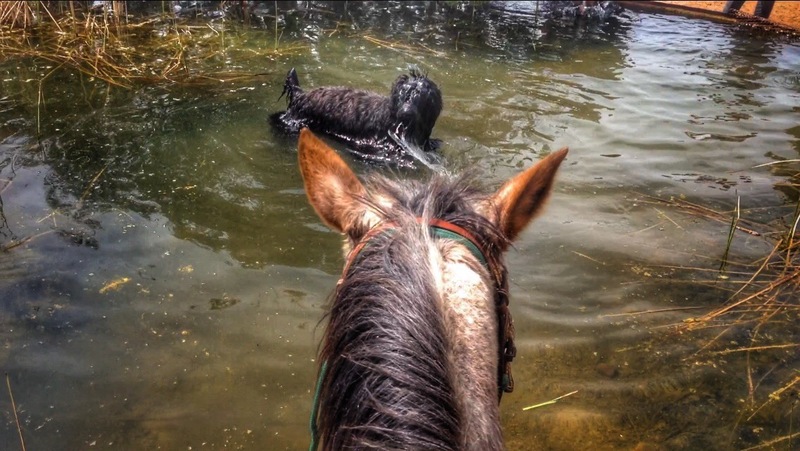 “She loved every minute,” Mel told me later, “but she bounded into the stock tanks to swim.” I don’t think Risa, Paige’s Appaloosa mare, was too entertained by Chloe’s attempt at fishing. This big, shaggy, wet mop of a dog stole the show that day. You can even see in the video where Rain, the bay mare, was tying to splash Chloe when she wades by. She has become quite the addition to our rag tag pack of trail dogs.